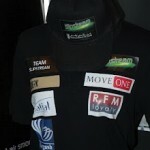 Move One is incredibly proud to be Gold Sponsors of Team Slipstream, who on the 6th May were crowned the UAE National Champions of the Intermediate Class 2012 at Yas Marina Circuit. Over 200 students, parents, education officials and VIPs descended on Yas Marina Circuit to compete in, and watch all the action of the 4th annual F1 in Schools UAE National Championship. 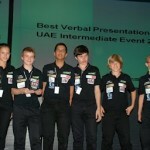 Competition was fierce as over 34 Senior and Intermediate teams went head to head in a bid to secure the title of UAE Champions and along with it, a coveted invitation to the F1 in Schools World Finals. 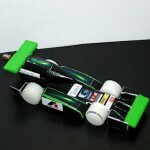 F1 in Schools programme aims to introduce engineering into the classroom through the excitement of F1 racing sees student teams develop and build all aspects of an F1 team. In addition to designing, building and racing small scale F1 cars along a 25 metre track, the teams are also tasked with designing a team identity, collateral and uniforms as well as securing sponsorships and marketing their teams. 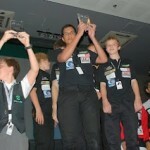 Members of the winning UAE Intermediate Champions 2012 team, Slipstream from Dubai College include Team Manager Tom Webster, 14 of Britain, Management Engineer Arjon Dave, 14 of India, Graphic Designer Cameron MacKay, 14 of Canada, Design Engineer James Hoad, 13 of Britain, Resource Manager Tom Murphy, 14 of Britain and Pit Display Manager, Libby Johnson, 14 of Britain. 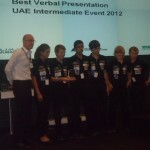 The team was supported by Teacher Mrs. Brenda Ashmore. 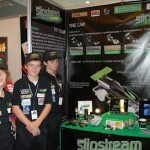 Congratulations Team Slipstream on your well deserved win! 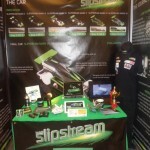 “I would like to say thank you for agreeing to sponsor Team Slipstream. Your help is much appreciated and enabled us to win the UAE National Championships. 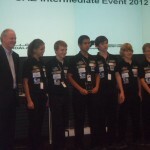 We emerged with the Fastest Car prize, Best Verbal Presentation, and overall winners of the Intermediate Class.